Sitting cross-legged in a circle, students from the Museums, Art and Society class at NYUAD gratefully accepted glasses of sugared tea and dates from their host, Sandi Hilal, who was in Abu Dhabi in March with Alessandro Petti, her long-term partner in life and art, for the opening of their first institutional retrospective. Although only in town for a few days, it is always part of Hilal’s artistic practice to be a “subject” wherever she goes and to exercise her right to be a host, despite also being a guest. Inviting the students into her living room was a performance that recognises the private space as an important social and political terrain for communities in exile. “It is about seeking agency as a human being,” she said to the students. “Even if I go to a place for three days, I can still contribute to the public sphere of the place. I can still be a subject and a host; I can still belong.” Living Room (2018) is a performance piece that refers to an earlier work with a Syrian refugee couple in Boden, a town to the north of where Hilal and Petti currently live in Sweden, through which many refugees enter the country. Hilal was commissioned by the Public Art Agency in Stockholm to make the work, based on her own experience as a migrant into the country, which she used as a way of questioning the notion of host versus guest. In a way this comes as little surprise since Petti, currently professor in Architecture and Social Justice at the Royal Institute of Art in Stockholm, was trained as an architect. Hilal, also an architect and urbanist, worked at UNRWA as head of its Infrastructure and Camp Improvement Programme in the West Bank for seven years until 2014. The two began to develop their socially engaged practice in 2007 when, together with Eyal Weizman, they co-founded DAAR (Decolonizing Architecture Art Residency) in Beit Sahour, Palestine – part-architectural studio, part-art residency – focusing on urban interventions and critical discourse. Discovering the exhibition unfolded like a journey in itself. 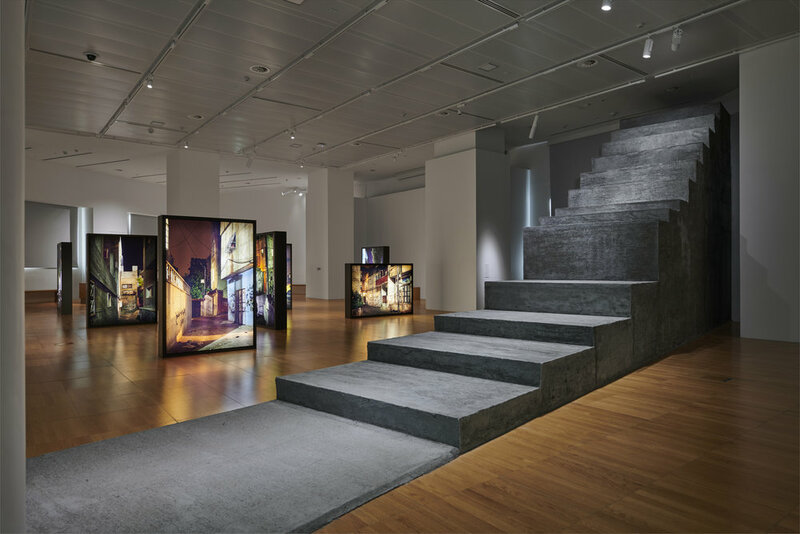 Although it began in the airy gallery hall where photographic lightboxes were strategically placed to recreate the feeling of taking a night-time walk through Dheisheh, the world’s largest refugee camp, situated in Bethlehem where the artists lived and worked for over a decade, it soon broadened. The conversation moved outward, both physically and conceptually, so that when I was staring up at the six-metre-high Concrete Tent (2015–2018) that was placed on the perimeter of the campus, my consciousness was not only directed at the living conditions for the victims of conflict but also for all those who might find themselves living as a “guest”, willing or otherwise, on foreign soil. The installation is made from a burlap tent that was initially built in Dheisheh and has been petri ed into a concrete house to summarise the tension between temporality and permanence; between a whole life lived in one place but with belongings partially packed. It aims to draw parallels between the different conditions of impermanence and displacement that affect a vast number of people living as guests in host countries. “We are interested in the idea of living in a suspended situation where decisions are constantly postponed and the state of limbo is always present,” Petti remarked. The lightbox-mounted photographs that open the exhibition, Refugee Heritage (2018), are taken by a UNESCO photographer Luca Capuano, whom Petti and Hilal commissioned to treat the camp with the same amount of monumental respect as he would a world heritage site, in a bid for the camp to be considered as such. It is a way of encouraging a reclamation of the personal histories that play out within the camps. “Refugee camps are a very important part of the way we can navigate history in general, yet those living there are asked constantly to dismiss what they built in exile as if it undermines their right to return,” Petti explained. 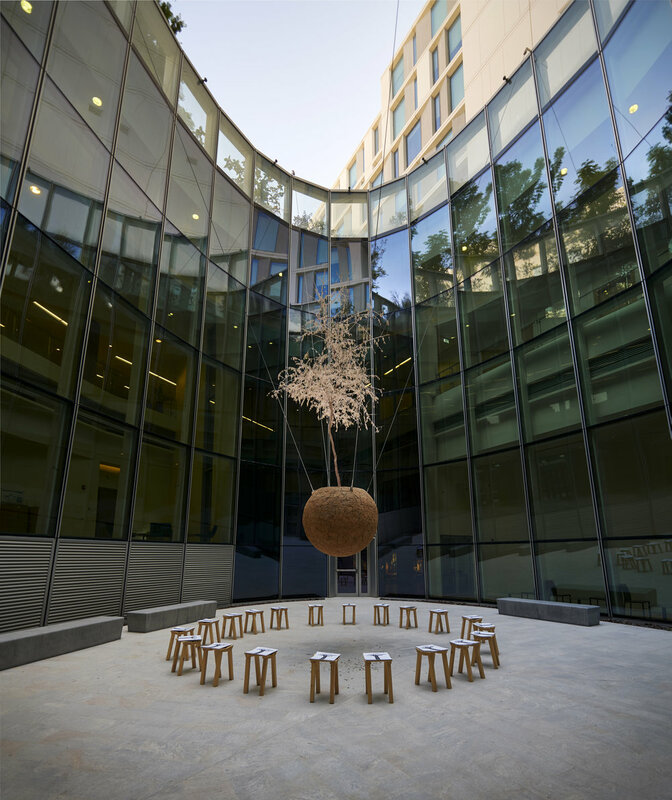 The other works in the show include Mujawara / The Tree School (2014–2018), a suspended ghaf tree inside an earth-clad spherical base (which is a nomadic work that always incorporates native trees), highlighting the state of rootlessness whilst also symbolising the tree of knowledge, and Common Assembly (2011–2018), an imposing concrete staircase that divides the gallery space in the same way as the arbitrary lines that were drawn on the map during the creation of the state of Israel in 1948. It also recreates the 1967 border, now straddled by the derelict Palestinian Parliament in particular, the construction of which began during the 1996 Oslo Accords. This poignantly empty edifice occupies a site sandwiched between Israeli territory and what is Palestine. Overall, the exhibition offers an immersion into several intersecting threads that underline Petti and Hilal’s non-linear and research-based practice. Simultaneously scholarly and visceral, the work elicits a physical and emotional reaction that helps audiences to walk the tightrope between the different states of being that we all somehow inhabit or understand. With a primary concern of shifting the dynamics of collective and individual agency, their work offers no conclusions but instead invites us to reassess our contemporary human condition and the various sites of our political imagination. Sandi Hilal & Alessandro Petti: Permanent Temporariness. February 24 - June 9, 2018. NYU Abu Dhabi Art Gallery, Saadiyat Island, Abu Dhabi.